I was born in Marino, Rome, Italy, the 25th of August, in 1986. I started to play the drums when I was 10 years old, studying as an autodidact and then taking lessons from teachers – Roberto Casciotti among the others. Then I studied over well-known methods like the Gene Krupa’s and the Buddy Rich’s. I began to practice what I’ve had learned, by playing with emergent bands, Italian folk bands and various brass bands. Now I’m studying with Tommy Igoe’s methods. From 2008 to 2009 I lived in the USA, in Ridgefield, Connecticut; in that period I’ve been able to play with some American artists, experience which I really made use of. In 2011, I started a project with my friend and musician Luka Fiorentini (piano, keyboards): we called that project EasyPop. The concept was to recreate a band like the old ones (in the 60s, 70s) which played many different styles and genres of music. Later on, other musicians joined our project and we developed a music show that we called “EasyPop – The History of Jukebox”. The main character of this show is a Jukebox: a reproduction of a Wurlitzer 1015, handmade by myself, which we bring throughout Italy and in the world. It contains 130 titles of Italian and International songs, from the 50s to the 80s, the Jukebox age. The audience is free to approach the Jukebox and make their selections; then, instead of being the 45rpm records inside the Jukebox, we actually play, as a live band, each and every selection made. Before every song, we like to tell a little story, an anecdote, about it; the show takes its name from that and from the vibe that the entire situation creates, making people remember, relive and experience that magic music era. I’m getting many satisfactions from this show, both as musician and in the management field. We have also released a live album, made from the recordings of our shows in 2014: the name is “EasyPop – La Storia del Jukebox. Live n.1” and contains 15 live songs + 3 bonus tracks (songs written by Luka Fiorentini). I’ve had the chance to play with some artists that made the history of Italian music in the 60s, one among the others Mr. Enrico Maria Papes, historic drummer of the band “I Giganti”, with whom I’ve had the pleasure to play in various theaters. In October 2014 I went back to USA, to Chicago, where I played with some local bands, in venues like the Chicago Blues and the Glenn Miller. 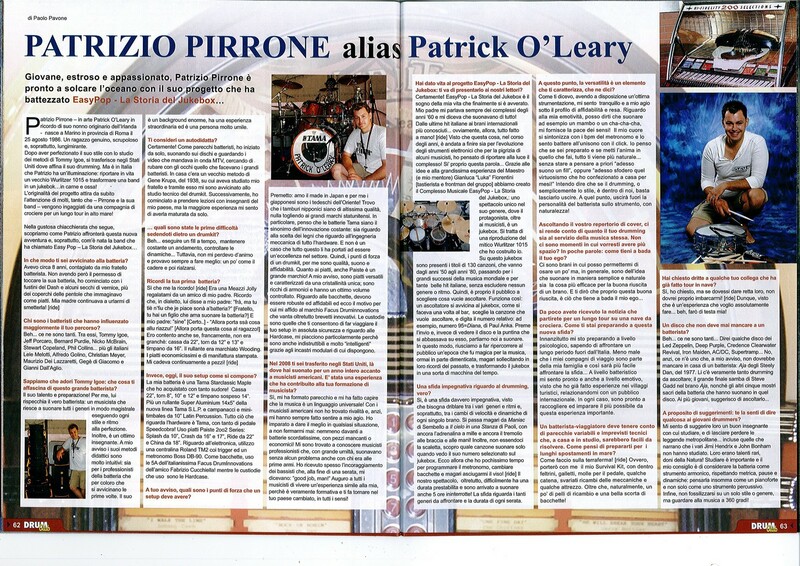 In 2015, I released two interviews about myself and my show on the Italian drum magazines Drum Club and Drumset Mag. we brought to Kenya our show, and since then we promote our charity project “A Dime for Their Jukebox”, to sustain World Friends Onlus and Banjuka School of Music and Dance. We’ve been reviewed by many important newspapers. In October 2016 we sailed on MSC Orchestra for a tour on Mediterranean Sea. Right now I’m planning with my band a music educational project for schools. I was born in Italy but I always loved Japanese people and admired their craftsmanship; I love “Made in Japan”, and speaking of drums, I love “Made in Canopus”. Canopus Drums customizes every feature of the drum set, making possible for me to produce my own sound. With Canopus I ain't got an ordinary drum set. I've got my own drum set, and that's unique and personal, and at the same time very versatile: I have a rock powerful sound when I need it, and fluid dynamics as well. It is perfect for me, because in my show “EasyPop - The History of Jukebox” I play nearly every music genre and rhythm. I found the right tone and power control. The strenghts of a drum set, for me, are quality, sound and reliability and that's what I have available with my new Canopus Birch Series. I choose a Natural Mat laquer finish, as I think that leaving the shell of his natural colour, the drums mantains his natural wooden warmth and sound. I'd like to congratulate with Canopus artisans for their perfect work on my drum set. 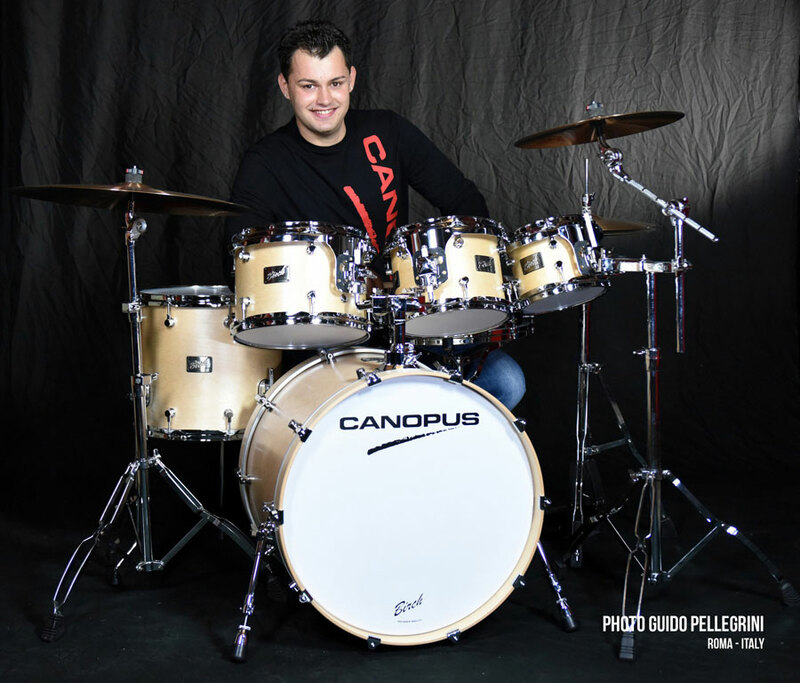 I'm proud to have joined the Canopus Family and to be endorser of this great brand!